1. 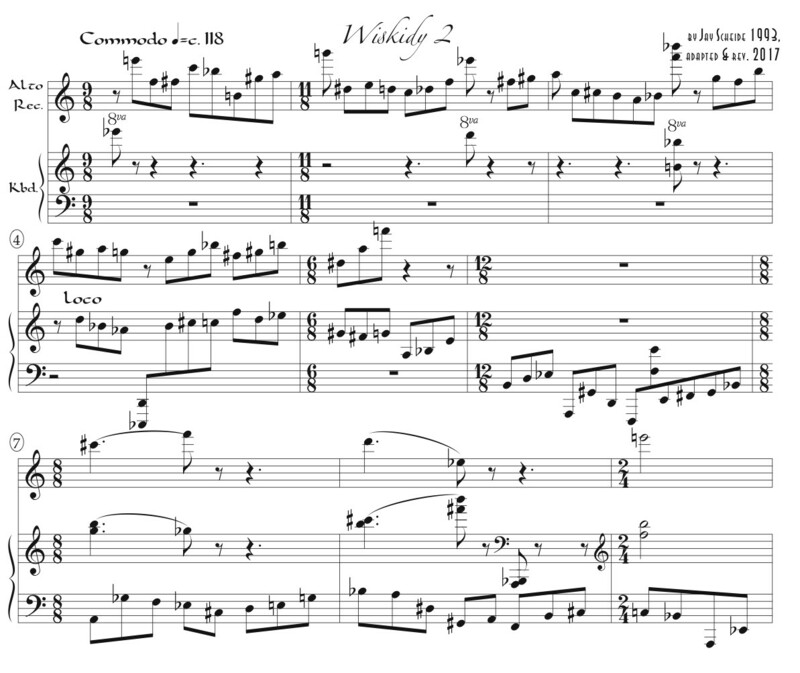 Wiskidy 2, for alto recorder, optionally doubling sopranino, and keyboard, 2. Homage to Ciconia & Nancarrow No. 1, and 3. Honkia Oberlinika. The title “Wiskidy 2” is derived from the offhand words of the Andean music band Kashwa while playing and singing on record and in performance in the 1990’s. Note that there is a related but quite different version of this piece, called just plain “Wiskidy,” in the “Set of Five Recorder Trios.” Homage to Ciconia & Nancarrow No. 1 relates to the rhythms (in particular) of 14th and early 15th century European “ars nova” and “mannerist” music as exemplified in people such as Guillaume de Machaut, Johannes Ciconia & Mateo da Perugia, and to the work of Conlon Nancarrow in the 20th century. Honkia Oberlinika has a jazz ostinato-type keyboard part to go with a jazz alto recorder part. There are no separate recorder parts, instead each player must have copies of the two scores. Revised Jan. 8, 2019.